PHUKET: Phuket, and the Rawai community in particular, lost one of its most dedicated and lovely people to Boxing Day tsunami. Leone Cosens, wife of Tim and friend to many, moved to Phuket from New Zealand some 11 years ago and quickly helped establish the Phuket Animal Welfare Society (PAWS), which, along with other organizations, has helped care for, sterilize, and therefore reduce Phuket’s stray dog population. 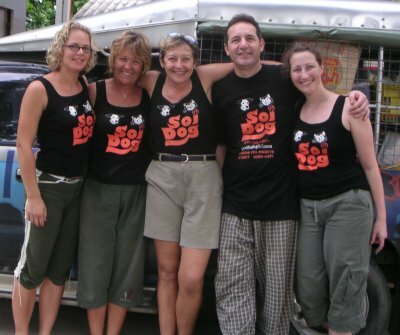 Leone worked with her Thai helpers selflessly, tirelessly, and very often at her own expense, to help strays in the south of the island, and around Nai Harn Beach in particular. Leone and her husband Tim worked hard in recent years, creating a beach paradise at Yanui Beach, near Laem Phromthep. It was there that she went to respond to a call for help from some guests staying there. It appears she was swept away by the strongest wave that demolished everything on and around the small, popular beach. Leone, like so many casualties that day, shad no chance of escape. Her friends and relatives can only be thankful that her end would have been swift. She will be deeply missed – and her fellow dog-carers will endeavor to continue her excellent work. Friends can pay their respects to Leone at Rawai temple, where her body will be kept until her funeral at noon on Friday.